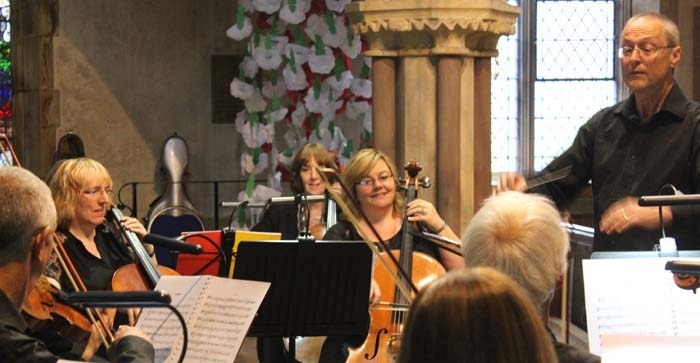 Above: Carol Haynes (on the left) playing with the Northern Camerata. She began learning to play the cello three years ago. 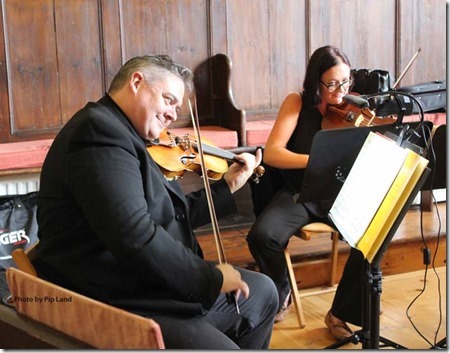 The Wensleydale Concert Series celebrated its first anniversary with another first-class and very enjoyable concert at Aysgarth church on Saturday, May 14. The series began in May 2015 with a memorable concert by the world-renowned cellist, Corinne Morris accompanied by pianist, Nico de Villiers. The other concerts during the first year were by Alicja Fiderkiewicz, Jonathan Bloxham , the Melicus Duo (Marie Vassiliou and Nico de Villiers), and Fenella Humphreys with Daniel Grimwood. Corinne returned on May 14 and this time she was accompanied by the Northern Camerata conducted by Andy Jackson. Carol Haynes, who runs her Dales Computer Series business from her home in Carperby, joined the Northern Camerata for that concert. As the first year closes there are a lot of good memories to look back on, and on a purely personal note it has been inspirational and great fun getting to spend so much time with our wonderful musicians and even get to play with them at home. I started Wensleydale Concert Series twelve months ago for a number of reasons. Firstly, I was travelling a lot to go to concerts and having talked to some elderly Dales people realised that many people who would like to go to concerts really cannot cope with driving to concert halls. Secondly my own passion for playing the cello led me to meet and become friends with a number of world-class professional musicians and I began to realise just how hard it was for them to generate concert work, especially if they have had to take time away from concert work. I also noticed that most local concert series heavily focus on bringing young musicians to play and more mature musicians are left struggling. The motivation to start our concert series really crystallised from my friendship with the cellist Corinne Morris who suffered from a debilitating shoulder injury for a number of years.She was trying to rebuild her career – not an easy task after being off the concert stage for so long. Finally as we started I was aware that there were concerts in Richmond in the winter and the Swaledale festival for two weeks in the summer but for the rest of the year there was not very much classical music to go and hear in Wensleydale. It has been particularly good to see our audience grow too and, whilst it will be good to grow it further, we have a really solid core audience who are becoming regulars and very enthusiastic. We have also learned some lessons along the way, the main one being that concerts in the winter months can be very difficult in bad weather and so we are now limiting our efforts from March to October. We want to develop the concert series in a number of ways. Firstly we want to keep the standard as high as possible … this is going to be a big challenge as in the first year I have had an enormous amount of help from musicians I know most of whom have performed for much lower fees than they would usually receive to help us get started. As I start to invite new musicians to perform, I realise we are going to have to increase our income to cover the costs. Larger audiences would help with more ticket sales for this but we have also decided to apply for charitable status and start looking from local sponsorship for the series. Secondly. we would really like some community and educational involvement in the concert series. With Corinne’s first concert we arranged for her to run a cello workshop in Carperby which was very successful. We have plans for other workshop or even possibly residential events in the future that will hopefully cater for the needs for local musicians and visiting musicians. We would also like to develop occasional larger scale community participation events. 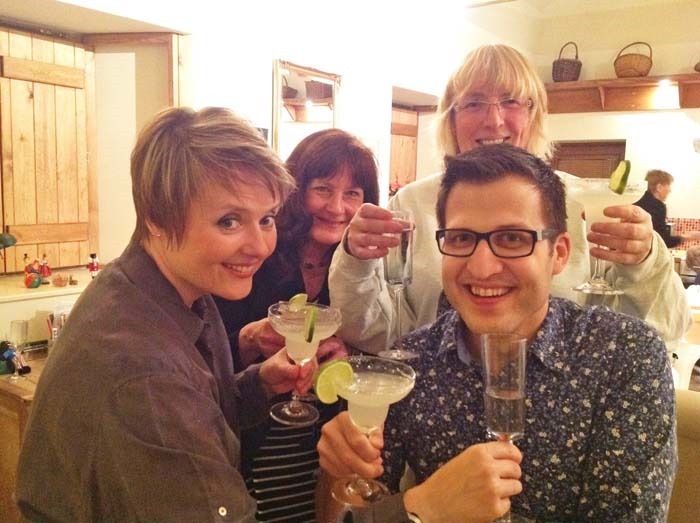 Above: Celebrating after the first concert in May 2015, l-r Corinne Morris, Alicja Fiderkiewicz, Carol Haynes (behind) and Nico de Villiers. The audience at Aysgarth church was spellbound by the stunning world-class performance by Corinne Morris and pianist Nico de Villiers on May 13, 2015. It was hard to believe one was sitting in a church in Wensleydale listening to such an awe-inspiring recital. The concert lived up to its title: The Romance of the Cello. It began with Beethoven’s Sonata in D Major, with its dramatic opening movement, followed by the haunting Adagio and a dancing fugue to finish. Morris displayed her supreme virtuosity and versatility when playing Debussy’s Sonata in D Minor and the audience was kept on the edge of their seats with the sudden changes of tempo and dramatic effects. The climax of the concert was the memorable Sonata in D minor by the 19th century French composer, Benjamin Godard. This emphasised the enthralling partnership between Corinne and Nico. And if that wasn’t enough, for the encore Morris played the slow movement from Rachmaninov’s Cello Sonata, reducing at least one member of the audience to tears. It was Alicja Fiderkiewicz’s turn four months later. Carol commented that Alicja has been a good friend of the concert series since it started, often travelling from her home in Carlisle to attend concerts. She filled the church with the emotions of two great composers when she presented a mesmerising piano concert at Aysgarth church on September 25. As she played Schubert’s final sonata Alicja shared with her audience his ability to immortalise the anguish of soul experienced by those in the throes of terminal illness – and also their special joy at still being able to experience the beauty of this world. Schubert died, aged 35, just months after composing his Piano Sonata No.21 in B flat Major. In the second half she took her audience into the inspirational world of Chopin, beginning with her deeply textured rendition of his Three Nocturnes. This was followed by a truly romantic Romanza (Concerto in E Minor) heightened by some delicate and moving playing. And finally there was the Polonaise-fantasie with its brooding, deeply contemplative evocation of a man considering the end of his life. Chopin did not, however, descend into melancholy but produced an enthralling and uplifting masterpiece, so well interpreted by Alicja. In November the Melicus Duo carried on what has become the tradition of the Wensleydale Concert Series in bringing world-class musicians to Wensleydale. Marie Vassiliou (soprano) and Nico complimented each other beautifully in a programme which included Pauline Viardot’s Madrid with its flirtatious flamenco-inspired rhythms and harmonies, an aria by Enrique Granados, and Alberto Ginastera’s music based on the folk songs and dances of Argentina. In the second half they turned to the heritage of the English language with works by Peter Klatzow, Richard Hageman and Erich Korngold. 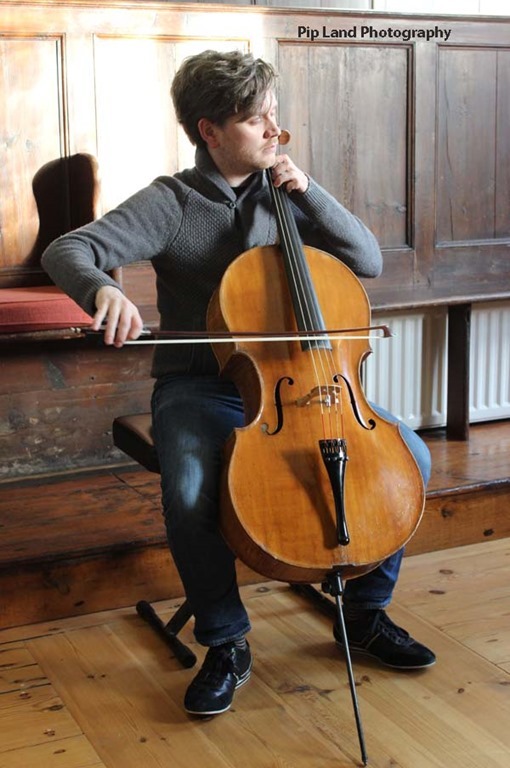 The solo cello concert by Jonathan Bloxham (above) was held in the Friends Meeting House in Bainbridge in January 2016. This was reminiscent of the musical soirees of the 19th century. The concert was entitled Bach – Up Close and Personal and Jonathan obviously enjoyed the intimate atmosphere. His compelling and utterly engrossing performance of three of Bach’s Suites for solo cellow was of the highest order and quality and many closed their eyes and allowed the warm, luxurious experience to envelop them. All savoured the moods and emotions he conveyed so well during his virtuoso performance with its consistently full, rich tone. Jonathan also introduced his audience to Howard Skempton’s Six Figures for solo cello and shared his fascination in how these short pieces explored creating music in new ways. Violinist Fenella Humphreys and pianist Daniel Grimwood presented an excellent concert in March 2016. Jonathan Sparey wrote: “The atmosphere created by Humphreys and Grimwood was very special and certainly will not be forgotten for a long time. “The programme was demanding for players and audience, including three major works of great complexity technically and musically, magnificently achieved by the two musicians. “Schubert’s Rondo has a reputation among violinists as a piece to steer well clear of because of its formidable demands, but here they were met and we heard a performance that was totally compelling. “Humphreys’ lovely violin (by Peter Guarneri of Venice in about 1720) was never overwhelmed by Grimwood’s sensitive playing of the piano. “We are so lucky – we would have had to go to the Royal Festival Hall to hear anything like that,” commented one woman as she left Bainbridge Meeting House following the concert by the New World Trio on Friday, September 16, 2016, organised by the Wensleydale Concert Series. It was a stunning performance which just got better and better as Andrew Long (violin) Katie Stables (viola) and Zoe Long (cello) shared the delicious harmonies of three string trios: Schubert’s B Flat Major D471; Beethoven’s G Major Opus 9, no 1; and Mozart’s Divertimento in E Flat Major K463.The whole building resonated as if in total harmony with the trio which was so incredibly synchronised. They began with Schubert’s Allegro which was like a soothing and joyful evocation of the Dales landscape. The harmonic richness of their playing, with each member of the trio giving virtuoso performances, brought out the expressiveness and warmth of the first two movements of Beethoven’s String Trio. And what a Presto! That definitely had the Wow factor as they truly threw caution to the winds and gave an amazing performance to complete the first half. The three musicians so enjoyed the intimacy of the Meeting House – and that intimacy added to the appreciation of Mozart’s String Trio. Alfred Einstein wrote that this was one of Mozart’s noblest works and said it had grown to such large proportions because it offered something special in the way of art, invention, and good spirits. The New World Trio captured all that and enthralled its audience with a breath taking performance – so complete an experience that it could never have been followed by an encore. They so obviously enjoyed making beautiful music together – from the sublime Adagio to the extraordinarily moving Andante. At the end we could only be astonished at being able to share in Mozart’s intensely passionate tour de force so exquisitely reproduced for us by the New World Trio.